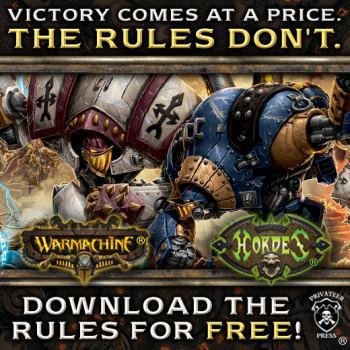 Want to play Warmachine or Hordes, but need the rules? Privateer Press has released the Mark II edition books for free. Even if you haven't played a single miniatures game, odds are you've heard of Warmachine. Along with its companion title Hordes, Warmachine is one of the most popular and successful wargames ever made, still running after twelve years thanks to successful supplements. Now publisher Privateer Press is making it a little easier for new players to get started with free copies of the core rules. Anyone who's interested can visit this website and download the Mark II editions of Warmachine and Hordes today. Warmachine is set in a steampunk fantasy world where humans, elves, dwarves and other races wage war through magic and powerful constructs called Warjacks. Hordes uses a compatible system, but instead focuses on the combat between monstrous creatures from the non-civilized wilds. Each game places an emphasis on smaller skirmish battles and aggressive strategies, so ducking behind defensive cover isn't the best approach. Each army has its own specific supplement, but the core books themselves are all you need to get started. Well, outside of some miniatures that is. Given Warmachine and Horde's history, publishing the core books for free is likely a good move to pull in new players. It's also possible the decision was prompted by competitor Games Workshop, whose Warhammer rules are completely free to download. Whatever the reason, it's a great way to see if Warmachine interests you before dropping the cash on miniatures and army books. The core books are available here, while physical copies of army books will be discounted until Sept. 3, 2015. And this is why when Warmachine first came out I was way on board for the game overall. The pieces were good quality, took to paint quite well and lovely detailing plus fielding a viable army was way less expensive than what Games Workshop's line of minis would be. Them releasing the ruleset for free is so much more awesome. If I still played tabletop wargames, I'd probably end up with Warmachine again. I do love the idea of the Jacks and I'm a huge fan of the Cryx armies. I'm aware that GW has released their rules for free too but I'm so over Warhammer at this point because the pricing of minis for those games are outrageous enough to make me feel like GW is anti-consumer. Nail in the coffin for me was seeing Dawn of War, both the initial release and the sequel, selling the "expansions" for outrageous prices. I daresay their idea of DLC pricing is one of the worst for gaming in general. Privateer Press is an awesome company and I feel like they are much more endearing to their customer base and not as interested in draining our wallets to have fun with their games. The best part is, you don't even NEED the faction specific rules. Each kit comes with a card that has all of the stats for the models in that kit. The only exception is if you're into Mercenaries, because the faction's subdivided, and who you can and cannot use for a list gets a bit murky if you don't have a reference on hand or memorized.